myoldmac.net - Apple Macintosh 512k - Buy it! Copy following code to your page to display vintage Apple Macintosh collectibles on your own website. The Macintosh 1984 aka 128k is the original Apple Macintosh personal computer. Its beige case contains a 9-inch monitor and comes with a keyboard and mouse. An indentation in the top of the case allows the computer to be lifted and carried. It had a selling price of US$2,495, though it had a price of around $2,000 when originally announced. The Macintosh was introduced by the now famous US$1.5 million television commercial by Ridley Scott, "1984", that most notably aired on CBS during the third quarter of Super Bowl XVIII on January 22, 1984. 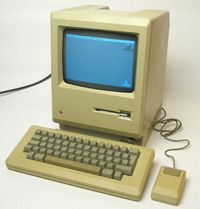 The sales of the Macintosh were strong from its initial release and reached 70,000 on May 3, 1984. After its successor, the Macintosh 512K, was introduced it was rebadged as the Macintosh 128K to differentiate it. The unit does not include a fan, but instead relies on convection cooling, which made it quiet while in operation. Steve Jobs insisted that the Macintosh ship without a fan, a marketing (not engineering) decision that persisted until the introduction of the Macintosh SE in 1987. The persistent overheating, and the design of the floppy disk drive, led to the nickname "The beige toaster". The original Macintosh was unusual in that it included the signatures of the Macintosh Division as of early 1982 molded on the inside of the case. The names were Peggy Aleixo, Colette Askeland, Bill Atkinson, Steve Balog, Bob Belleville, Mike Boich, Bill Bull, Matt Carter, Berry Cash, Debbie Coleman, George Crow, Donn Denman, Christopher Espinosa, Bill Fernandez, Martin Haeberli, Andy Hertzfeld, Joanna Hoffman, Rod Holt, Bruce Horn, Hap Horn, Brian Howard, Steven Jobs, Larry Kenyon, Patti King, Daniel Kottke, Angeline Lo, Ivan Mach, Gerald Manock, Mary Ellen McCammon, Vicki Milledge, Mike Murray, Ron Nicholson Jr, Terry Oyama, Benjamin Pang, Jef Raskin, Brian Robertson, Dave Roots, Patricia Sharp, Burrell Smith, Bryan Stearns, Lynn Takahashi, Randy Wigginton, Linda Wilkin, Woz, Pamela Wyman, Laszlo Zidek, and two others.